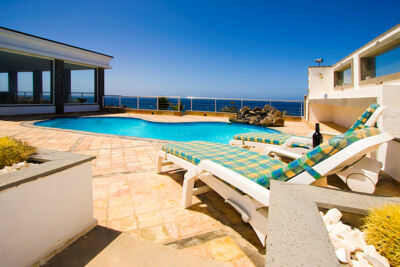 Villa Neptune is a situated on the front line in the Playa Blanca resort and therefore enjoys magnificent sea views. It is a luxurious villa with three bedrooms and two bathrooms. This luxurious front-line 3 bedroom, 2 bathroom villa and is only 15 minutes walking from the nearest restaurants, bars and shops. Outside the villa boasts a privated heated pool and a 6 seater jacuzzi. There are plenty of sun loungers around the pool, as well as a patio area with seating and table and chairs for alfresco dining. The villa also has gated off street parking. Maid service is twice a week.